The black scale, Saissetia oleae (Olivier, 1791) (Hemiptera: Coccidae) is an important pest of citrus and olive trees. Originally from South Africa, this scale is now distributed worldwide. In Florida, black scale is found on citrus (Citrus spp. ), cultivated olive (Olea europaea L.), avocado (Persea americana Mill. ), and many popular landscape plants. It is likely that black scale, like many invasive pests, was imported to the United States on infested nursery plants. 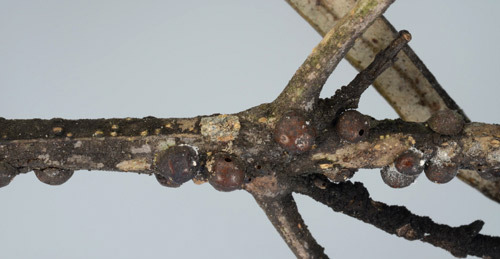 Based on their small size and the unique life history of scale insects, these insects are difficult to detect and control. Figure 1. Adult female black scales, Saissetia oleae (Olivier) on cultivated olive (Olea europaea L.). Photograph by Lyle Buss, University of Florida. Black scale has a cosmopolitan distribution, with records in Europe, Asia, Africa, Australasia, the Pacific Islands and in the Americas (CABI 1954). Female black scales deposit eggs from April to September and, like other species in the genus Saissetia, protect them beneath the body until they hatch. Each female can lay from a few hundred to over 2,500 eggs (Tena et al. 2007). Incubation time for the eggs varies due to temperature, with eggs laid in the summer hatching in 16 days and eggs in the winter taking up to six weeks to hatch. Black scale typically has one or two generations per year, but three generations have been observed in certain regions. Reproduction is largely parthenogenetic (a type of asexual reproduction where eggs develop without fertilization), although males have been reported. Figure 2. Nymphs of the black scale, Saissetia oleae (Olivier) crawling on adult females and on cultivated olive (Olea europaea L.). Photograph by Lyle Buss, University of Florida. The first nymphal, or immature stage, of scale insects is known as the crawler (Figure 2). This is one of two mobile stages of the scale (the other being the winged, adult male, if present). Upon hatching, the crawlers move out onto the plant. Crawlers may establish on the leaves (Figure 3), fruit or young woody parts of the host plant, and once settled they insert their mouthparts into the plant tissue and begin feeding. They undergo two molts before maturing into the adult stage and moving to older woody parts of the plant to feed. The body of adult female black scales continues to expand and eventually hardens into a shell-like structure that serves to protect the eggs and nymphs. Adults rarely move from their established feeding site, typically on woody plant material. Under heavy infestations, females may develop on the lower leaf surfaces of the host plant. Figure 3. Nymphs of the black scale, Saissetia oleae (Olivier) on a cultivated olive (Olea europaea L.) leaf. Photograph by Lyle Buss, University of Florida. Black scale population dynamics are highly influenced by abiotic factors. Changes in temperature and relative humidity in particular greatly affect black scale population age and size. Temperate conditions with high humidity favor black scale population growth, and a prolonged period of this kind of weather can lead to outbreaks. According to Tena et al. 2007, first instar nymphs experience high mortality when temperatures exceed 30°C and relative humidity is over 30%. Black scales overwinter as second or third instar nymphs, which are more resistant to adverse weather conditions than eggs or first instar nymphs. In Israel, higher black scale populations were found on irrigated versus non-irrigated olive. Two generations were observed on the irrigated olive and in some citrus groves. One generation was found on non-irrigated olive and citrus. It is likely that irrigated olive groves have a higher relative humidity, which is conducive to scale development. Another explanation, offered by Rosen et al. (1971), is that Sassieta oleae is actually a species complex, with several different strains that have different life histories but are morphologically indistinguishable. Black scale has been reported on citrus, olives, apricots, oleander and other hosts in California. In Florida, black scale has been reported as a pest of citrus, avocado, olive, tropical fruit and landscape plants. Black scale is of particular concern for citrus and olive producers in Florida. Plant architecture is an important feature for scale host selection and it appears that the black scale prefers trees with dense branching, especially when the trees are planted close together. Rosen et al. (1971) reported damage on olive trees in Israel due to outbreaks of the black scale. They suggested that outbreaks were due to a disruption in the insect community and reduction of beneficial insects caused by the heavy use of non-selective pesticides for control of Dacus oleae (Gmelin), the olive fruit fly. Black scales feed by attaching to the leaves and branches of their host plant and sucking the sap from inside the plant tissue. Depending on the severity of the scale infestation, the resulting damage to the plant may vary. As the scales feed, they exude a sticky, sugary substance, called honeydew, as a waste product. The honeydew falls from the feeding site and coats the leaves and fruit of the host plant or nearby surfaces, which encourages growth of sooty mold (Figure 4). Sooty mold is a black fungus that grows in a thin layer over the substrate where honeydew is present. Though the mold is not toxic to plants or humans, it can cover the leaves, reducing the plant’s photosynthetic capabilities, and decrease the market value of affected fruits and plants. Honeydew can attract ants that feed on the sugary substance. The presence of ants is a good indicator of scale infestation. Figure 4. 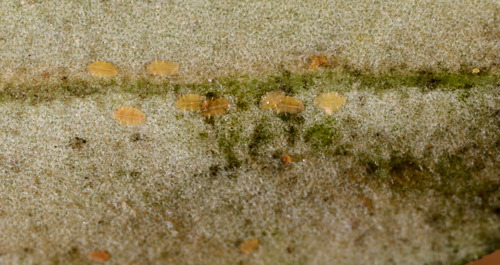 Sooty mold on cultivated olive (Olea europaea L.) leaves and stems indicates the presence of adult black scales, Saissetia oleae (Olivier). Photograph by Lyle Buss, University of Florida. The primary method of black scale management is biological control. 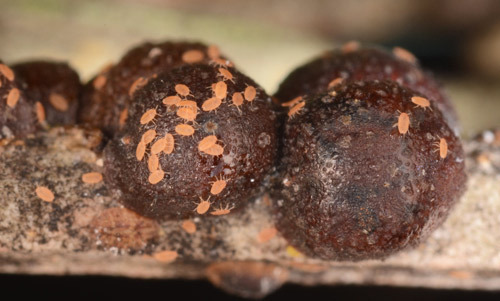 Classical biological control is a strategy commonly used for invasive pests and involves importation of the invasive pest’s natural enemies from the pest’s native region. The parasitoid wasps Metaphycus helvolus (Compere) and Metaphycus lounsburyi (Howard) (Hymenoptera: Encyrtidae), also native to South Africa, have been released for control of black scale in olive and citrus fields (Figure 5). Though closely related, parasitoids differ in their life histories. Metaphycus helvolus attacks second or third instar black scale nymphs whereas Metaphycus lounsburyi parasitizes third instar nymphs and adult females. These parasitoids are typically released for augmentative control of the black scale, though some established populations have been reported. Figure 5. Exit holes in adult black scales, Saissetia oleae (Olivier), indicating the presence of the parasites that aid in black scale control. Photograph by Lyle Buss, University of Florida. A southern California survey of primary and secondary parasitoids on Sassetia oleae found that parasitoid abundance varied by location, but that the same species were found throughout the state (Lampson and Morse, 1992). These include four primary species: Metaphycus bartletti Annecke & Mynhardt, Metaphycus helvolus (Compere), Scutellista caerulea Motschulsky, and Diversinervus elegans Silvestri. Secondary parasitoids recorded throughout California were Marietta Mexicana (Howard), Cheilonerus noxius Compere, and Tetrastichus minutus (Howard). In the coastal, intermediate, and interior regions of southern California, the most abundant parasitoid observed was a Metaphycus species. Although a variety of seemingly effective parasitoids exist, black scale is still considered an economically damaging pest of citrus and olive and outbreaks still occur. Parisitoids, like most insects, are subject to harsh environmental conditions which may limit their effectivenss as a control agent. For example, periods of excessively hot or dry weather can reduce parasitoid populations. Additionally, these insects require the third instar nymphs or adults for oviposition so synchronization of the parasitoid and prey populations is required. Failing to release biological control agents at the correct time can render them useless, unless the population can establish. However, for the parasitoid to become established, it must have regular access to black scale nymphs and adults, which suggests that the black scale population in the field may never be eradicated. For growers practicing Integrated Pest Management, these biological control agents simply augment existing control measures, with the goal of keeping the pest population below a determined threshold. In this method, total pest eradication is not a priority, as it is not realistic. The best use of the black scale parasitoids would be to release species that do not compete with each other for resources, such as preference for nymphs of different stages or adults. Several insects prey upon black scale nymphs. Beetle larvae, lacewing larvae and thrips were reported living among the scales, feeding on the crawler stage nymphs in olive groves (Applebaum and Rosen 1964, Rosen et al. 1971). Black scale populations are highly influenced by field conditions, ranging from temperature and humidity to type of host plant. Rosen et al. (1971) found that olive trees with many branches close together, especially when planted close to other trees, were more likely to become hosts of the black scale. Trees that were pruned back severely or planted apart from one another were less likely to suffer a black scale infestation. Pruning is also useful in reducing populations on infested trees. Previously employed management practices can affect black scale population size and age distribution. The use of pesticides, for example, must be timed with the presence of the crawler stage of the scales to be successful. Pesticides are not effective in controlling adult scales because the chemicals cannot penetrate the insects' thick, waxy exterior. Eggs are also not affected by chemical control because the female’s body covers and protects them until they hatch. Biological control of the black scale is the most promising method for management, with many species of parasitoids currently being used. Applebaum SW, Rosen D. 1964. Ecological studies on the olive scale, Parlatoria olaeae, in Israel. Journal of Economic Entomology 57: 847-850. Argyriou LC, Mourikis PA. 1981. Current status of citrus pests in Greece. Proceedings of the International Society of Citriculture 2: 623-627. Barbagallo S. 1981. Integrated control of citrus pests in Italy. Proceedings of the International Society of Citriculture 2: 620-623. CABI. 1954. Saissetia oleae. CAB International Distribution Maps of Plant Pests. (15 August 2014). Gill RJ. 1988. 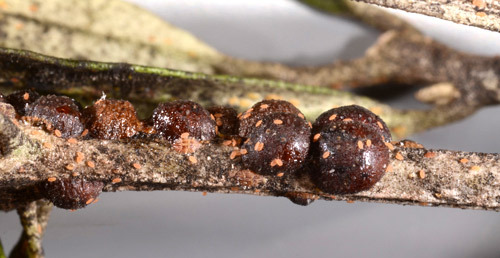 The Scale Insects of California Part 1. The Soft Scales (Homoptera: Coccoidea: Coccidae). Technical Services in Agricultural Biosystematics and Plant Pathology, California Department of Food and Agriculture, Vol. 1: xi + 132 pp. Hamon AB, Williams ML. 1984. Arthropods of Florida and Neighboring Land Areas, Vol. 11.The soft scale insects of Florida (Homoptera: Coccidea: Coccidae). Florida Department of Agriculture and Consumer Services. Contribution 600. Florida Department of Agriculture, Gainesville. 194 pp. ITIS. 2014. Saissetia oleae (Olivier, 1791). Integrated Taxonomic Information System. (15 August 2014). Lampson LJ, Morse JG. 1992. A survey of black scale, Saissetia oleae (Hom. : Coccidae) parasitoids (Hym. : Chalcidoidea) in southern California. Entomophaga 37: 373-390. Rosen D, Harpaz I, Samish M. 1971. Two species of Saissetia (Homoptera: Coccidae) injurious to olive in Israel and their natural enemies. Israel Journal of Entomology 5: 35-53. Tena A, Soto A, Garcia-Marí F. 2007. Parasitoid complex of black scale Saissetia oleae on citrus and olives: Parasitoid species composition and seasonal trend. BioControl 53: 473-487. Publication Date: February 2015. Revised February 2018.